Our sense of smell is very delicate and highly sensitive. 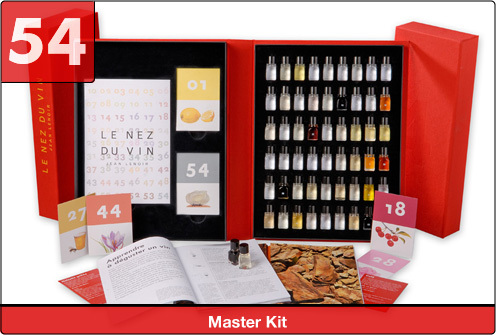 Practice allows us to recognise and identify the 54 aromas most commonly present in wine; thus, improving our appreciation and enjoyment of wine. These are the typical aromas found in red and white wine (including Sparkling, Champagne, Rosé, Port) from around the world. They give us an indication of the wine's origin, the grape variety as well as the vineyard, the winemaking techniques used and the aging conditions. Memorising these aromas provides an accurate and coherent vocabulary to further stimulate our appreciation of fine wines.